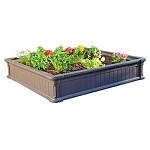 Lifetime 4 x 4 ft Raised Garden Beds are designed for square foot gardening, which is more reliable than traditional row gardening. 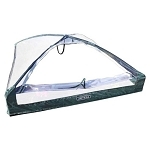 The yard bed panels are made of high-density polyethylene (HDPE) plastic for longlasting toughness and developed to snap together rapidly and easily. Stackable, too!